NB: Please note that Legal Online will be decommissioned on 31 December 2013. From now on, all updates will include links for Westlaw AU only (with the exception of the Journals available on Checkpoint, which will have an extra PDF). For further information, please click here. Persecuted women who seek to enact the protections of the Refugee Convention face barriers that persecuted men do not. It is far more difficult for them to obtain access to countries of asylum in order to make a claim. The capacity of some women to have their claims acknowledged is also diminished. Assessment procedures in Australia tend to prioritise the claims of men within family groups and make women reliant on the success of their husband’s case. Australia’s humanitarian visa program could be revised to alleviate many of these disadvantages, reduce delays and the incidence of boat journeys while continuing to assist Australia to comply with its international obligations. How the Ombudsman and the Ombudsman’s office operates is fundamentally important to their position as an independent reviewer of government actions. This article analyses the governance, employment and financing arrangements for the Office of the Commonwealth Ombudsman, drawing attention to the Executive’s matrix of influences over the office. By exploring the circumstances surrounding former Ombudsman Allan Asher’s resignation, the analysis demonstrates the lack of independence of the office. This article concludes that the way in which Asher sought to bring himself before the Senate Estimates Committee was warranted given the absence of available alternatives. Importantly, the role of the Ombudsman’s office will need to be reconsidered in light of the fact that decisions regarding the Ombudsman and the office’s resources are effectively being made by the very people who the Ombudsman examines. Plaintiff M47 v Director General of Security (2012) 86 ALJR 1372;  HCA 46 is the latest skirmish in the long-running battle between the Executive, Parliament, and the courts over the running of Australia’s immigration program. This article argues that although a majority of the High Court avoided an opportunity to overturn or even consider the notorious decision of Al-Kateb v Godwin (2004) 219 CLR 562, Plaintiff M47 is nonetheless an assertion of the High Court’s willingness and ability to ensure that executive discretion is tempered by review and accountability mechanisms. This article analyses the way their Honours approached the case, particularly the question which unexpectedly became the deciding issue: the validity of the regulation which required the plaintiff’s visa application to be denied. It then considers the consequences of the decision for the plaintiff (and the 50 others in his situation), for Australia’s complex migration law framework and for the still-simmering issue of indefinite detention. 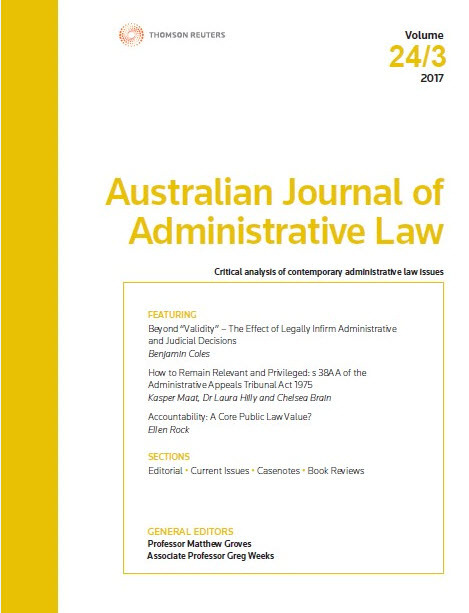 For the pdf version of the table of contents, click here: WAU – AJ Admin L Vol 21 Pt 1 Contents.